The ever-popular Japanese sandwich is now part of Mother’s Day brunch! 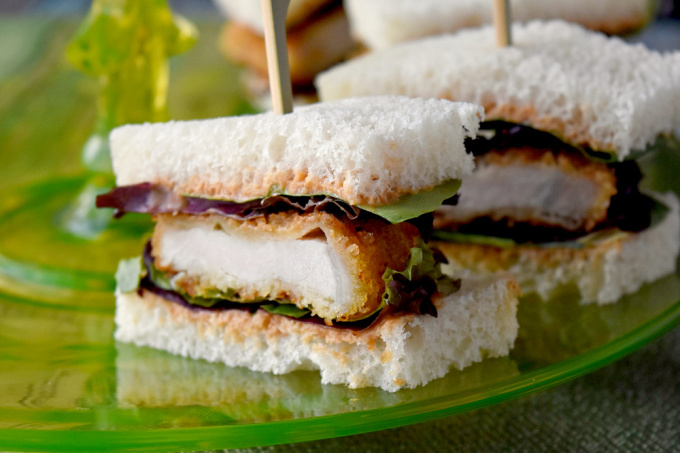 Katsu Sando Finger Sandwiches are easy to make and fun to eat. Topped with tonkatsu style mayonnaise, they pack a flavor punch for Mom. Yes, I know this is not your typical Mother’s Day fare. It’s not even typical brunch fare. But it is something different to serve your mother or at your next brunch party. And the best part of about it these finger sandwiches aren’t fussy. They’re super easy to prepare! I haven’t brunched in a long time, but every time I have gone it’s pretty much the same food. There’s your eggs or custom omelets, waffles with its sweet and savory toppings, and countless quick breads and muffins. Maybe there’s some roasted meats of some sort and some salads including a pasta salad or two. I know finger sandwiches aren’t typically served at brunch, but why not? Isn’t brunch basically breakfast tapas? It’s bite sized bits of breakfast or lunch foods that you nibble your way through while celebrating mom. At least that’s what I think of for Mother’s Day brunch. Muffins, maybe a charcuterie board, fruits on kabobs, pancakes on kabobs; endless possibilities. 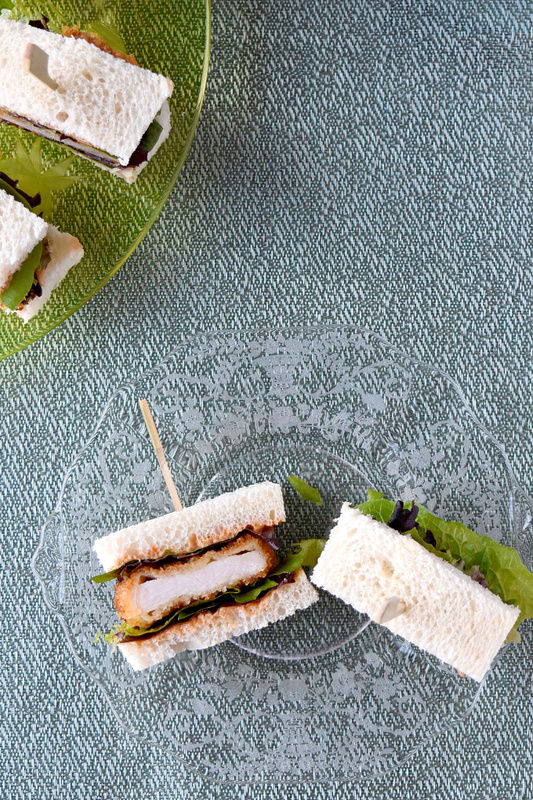 So, I say these katsu sando finger sandwiches are perfect Mother’s Day brunch food! What’s a katsu sando finger sandwich? Katsu sando is a Japanese version of a schnitzel sandwich. There’s a subset of Japanese cuisine obsessed with Western dishes. It’s called yōshoku. The theory is that a restaurant on Tokyo introduced this sandwich on their menu in 1899. And since they love Western cuisine, they loved the flavors in this sandwich. It’s stuck around and is even more popular than ever. Basically, katsu is cutlet and sando is sandwich. It’s a cutlet sandwich. Who knew I’ve been eating these things since I was a little kid?? The traditional katsu sando is a pork cutlet dredged in flour, egg, then panko and fried until cooked. It’s sandwiched between two slices of milk bread (called shokupan). Oh, there’s also a tonkatsu sauce spread on the bread, too. Sometimes there’s lettuce, cabbage, kimchi? Who knows? But that’s the basics to the katsu sando finger sandwich. It’s an A1 like sauce. You can buy the most preferred version here. There’s a few recipes you can use to whip up a sauce for your sandwich. OR you can simply make my tonkatsu style mayonnaise for your sandwich. I’m sort of addicted to it. You might be, too, after you try it. You might want it on all your sandwiches. Just warning you. I know I’ve talked about this before but toasting your panko is a game changer when it comes to the crunch factor. It works when you’re air-frying, oven frying, or traditional oil frying. I don’t use panko without toasting it beforehand. And it’s so easy to toast! I spread it out on a baking sheet, pop it into the oven, and turn the oven on. No, I don’t wait for it to preheat. That’s not necessary. As soon as it the panko is light to medium brown, you’re good to go. Let it cool a little bit before you try to put it in your shallow dish. I’ve burned myself on more than one occasion for being impatient. I’m just full of tips today! I URGE you not to skip resting the pork. This is key in not only keeping the coating crispy, but also keeping it on the pork. If you skip this step it will just fall off the meat. And that’s never a good thing when you’re breading and frying anything. I’ve learned this the hard way. Please take the time to rest the pork and let the coating hug that tender pork. It’s not fun to bite into a katsu sando finger sandwich and have the pork just pull right out of the coating. It makes the sandwich hard to eat and oh so messy. Finger sandwiches easy bites to nosh on. Having the meat fall out is not easy to nosh on. See how the coating just hugs the pork? Yes, there’s a few little pockets. I think those are inevitable. But most of the coating is sticking to the pork. The pork doesn’t slide out of the breading and this is two to three bites of deliciousness! You can see the color of the tokatsu style mayonnaise I made. It starts to seep into the tender bead making it all just meld together perfectly. I added the spring greens for a little color and added flavor. And make it more like a finger sandwich. Seriously. Doesn’t that just look delicious? And you know what the best part about this sandwich is? You’re supposed to make it ahead of time and refrigerate it. Yes! I’m not kidding. You make these ahead of time. It gives all the flavors time to marinate and party together before they become a party in your mouth. I’ve just introduced you to one of the best picnic sandwiches ever. It’s a great lunch for work, make ahead weeknight dinner, or just to keep on hand for an easy meal. Plus, you can make them out of chicken, beef, and pork. Or any other meat you can thinly slice and bread. I’m going to give you another tip! You can easily make these low carb. How you ask? Well, it all comes down to the type of chicharones or pork rinds you buy. If you buy one package that are extra crispy and one package that’s more traditional you can easily make this pork carb friendly. You take the traditional style chicharones and process them until they’re a flour like consistency. Then you take the more crispy chicharones and pulse them until they’re a coarse consistency like panko. Voila! Dredge in the finely ground pork rinds, then egg, then the coarse pork rinds. If you’re not a huge fan of pork rinds (What’s wrong with you really? They’re like deep fried bacon!) then you can use coconut or almond flour for the flour dredge. And you can use a low carb bread to make breadcrumbs for the panko coating. I would toast the bread or put it in the oven to dry out, but it would be a great way to have this katsu sando finger sandwich on a low carb diet. There are endless possibilities with this recipe! 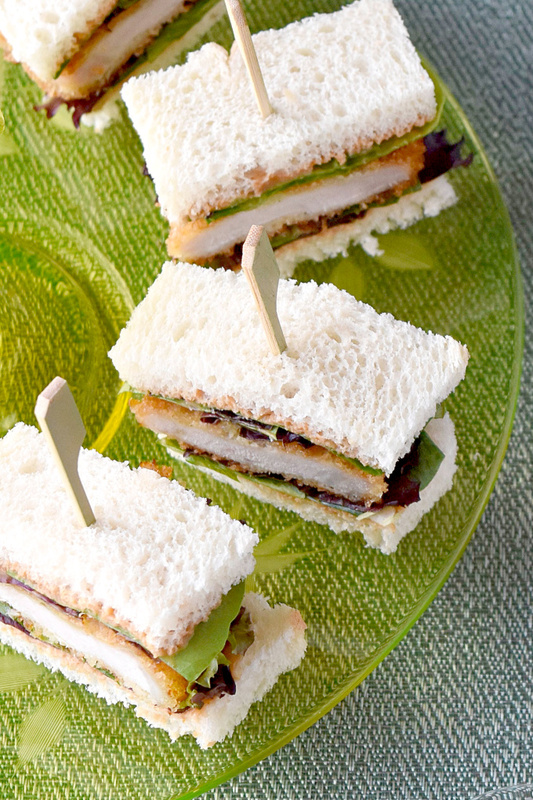 I know my mother would love these katsu sando finger sandwiches for mother’s day. And since my step-mother follows a low card lifestyle, I can make them for her, too. What are you planning for Mother’s Day? There’s some more recipe inspiration from the rest of the bloggers participating today. Place the panko in a shallow dish. Combine the flour, garlic salt, sage, and black pepper in a shallow dish. Add the eggs to a third shallow dish and lightly beat them. Dredge the pork in the flour, the egg, then the panko. Place on a plate a repeat these steps with all the pork chops. Cover the chops with plastic wrap and refrigerate at least 30 minutes. While the chops are chilling, combine the mayonnaise with the ketchup, soy sauce, Worcestershire sauce, mustard powder, and sesame oil in a small mixing bowl. Refrigerate until you’re ready to assemble the sandwiches. Remove the pork from the refrigerator. Heat a skillet over medium-high heat. Add 1/4 inch of oil to the pan. When the oil is hot, add the pork and cook until golden brown on each side; about 3 to 4 minutes per side. Remove the pork to a wire rack to cool slightly. Spread some of the tonkatsu style mayonnaise on each of the 8 slices of bread. Top with lettuce, a pork chop, more lettuce, and the second piece of bread. Place the toothpicks to keep the sandwiches from falling apart after you slice them. Depending on the size of your bread and your chops, you might need 3 to 4 toothpicks per sandwich. My bread was pretty small, so I used three. Using a bread knife, carefully slice through your sandwich. Wipe the knife between each slice to keep the sandwiches clean. Refrigerate until you're ready to serve. Serve with extra tonkatsu style mayonnaise. To taste the panko, spread it out on a baking sheet and bake at 350 until slightly golden brown. This makes for a crispier coating.